If you are looking for a dresser right now and are short on cash, I have a few suggestions for you. Chests of drawers seem boring, but think about it: they take up a lot of real estate. As much as the bed, linens and window treatments, your chest of drawers can make or break your bedroom design. The secret to choosing a cheap chest of drawers is to find one that does not attempt to imitate the style of more expensive furniture in your bedroom, but rather complements it. Fake wood? Maybe not. Wood tone wicker instead? For sure. 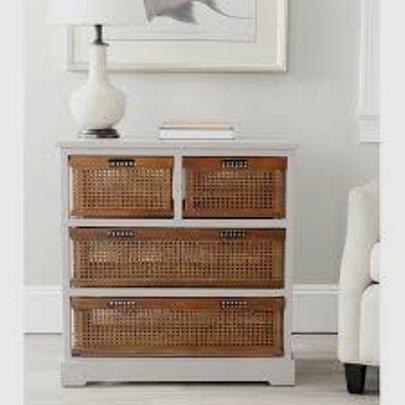 Overstock.com lists this 4-drawer pine and wicker chest of drawers at $224.99. Technically, it is a storage unit for a living area, but it would work perfectly as a rustic-looking bedroom dresser. 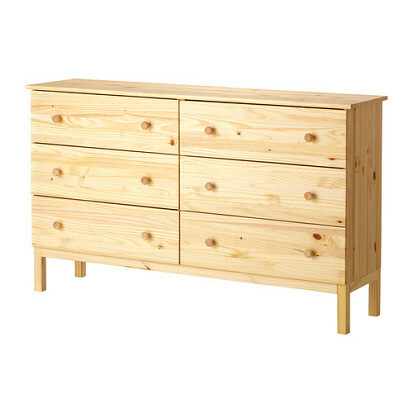 Ikea sells the unfinished wood Tarva 6-drawer chest for $179.00. As it is solid unfinished wood, it can be painted or stained to look more expensive. Add some splashy hardware and paint into the mix and no one will ever know how very little you spent. 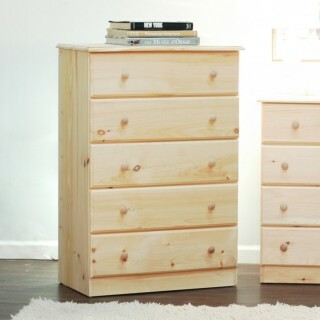 Another affordable unfinished option is the solid pine 5-drawer chest from Gothic Cabinet Craft for $199. If you opt for one of their custom finishes, the price of the chest increases. Again, paint this in a custom shade of paint and replace the hardware, and you'll have a dresser that you will love. Also, their furniture is supposedly made by New York City carpenters, or at least it was when the company opened many years ago. Since I refuse to include anything made with MDF or particleboard, the pickings are slim for new pieces. Yard sales, Craigslist and eBay could provide you with affordable refuge from cheap composites, or check out your local unfinished furniture warehouse.